Plants love the warm, humid, cozy protection of a greenhouse. The problem is that pests and diseases do also. We have to get rid of them to keep our precious plants healthy. 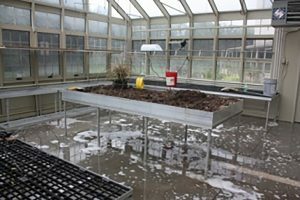 A deep cleaning does not only that but also improves the overall aesthetics of the greenhouse. It’s a job—there’s no doubt about that, but it helps if you break the chore down into the simple steps below rather than careen from one task to another and back again. Luckily enough, the folks at HousewaresInsider.com have compiled a short list of handy steps to follow. “Shop vac” or sweep down walls, internal structures and peripherals, such as tables, benches and containers. Start at the top where dangerous organisms lurk in such places as rafters and window ledges. Clean the floor of the assorted debris that gathers there: soil, organic matter, weeds, broken pottery shards. Now scrub or power wash everything. If you use soap, be sure that it is a gentle, natural soap that leaves no residue. Otherwise, rinse very thoroughly to remove any residue. Hydrogen peroxide-based products are both user- and environment-friendly. Garden disinfectants work fine, as do specialty greenhouse cleaners combining sulfuric acid and wetting agents. Whatever you use, it is of utmost importance that you follow manufacturer’s directions. Wood tables and benches and any concrete areas (and, actually, any textured surface) need special attention. They are favorite places for root rot diseases, algae and insects to breed. If you are going to reuse containers, clean thoroughly to remove all soil and debris even if there has been no problems with disease. Plants need all the sunlight they can get. Keeping the glass clean is a “must do.” Begin by lifting of any moss or algae with any utensil that won’t scratch the glass, but you really can’t beat those plastic plant labels that can get into every crack and crevice. Wash the glass with a firm brush and a mild all-purpose liquid cleaner that doesn’t need rinsing. Open the windows to speed up drying and give the hinges a quick fix of WD-40 while you’re at it. To clean the gutters, put on rubber gloves and scoop out the accumulated debris. Use a wire coat hanger to “ream out” the top of fall pipes. Then use the hose to sluice away the remaining dirt. To clean water butts, tip over to drain out any standing water. Scrub out the inside with a coarse brush and rinse with clean water. Avoid bright-colored clothing, especially yellow or blue—you’ll attract insects who will “stalk” you right into the greenhouse.